Dental implants are small replacements for tooth roots; they are made of surgical materials specifically formulated for dentistry. Our local oral surgeon or the periodontist places the dental implant in the area of the missing tooth, and the implant is completed with a dental crown, bridge or a denture by your restorative dentist, Dr. Wood or Dr. Spooner. 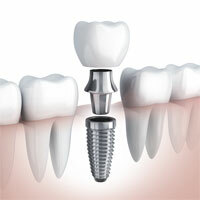 A dental implant and crown is generally the recommended approach to replace a single missing tooth, when possible. The single implant crown offers the advantage of not having to drill other teeth for support, as with a traditional dental bridge. Multiple dental implants may be used to replace missing teeth and anchor a fixed bridge or denture. Because they support the bite, they can sometimes help reduce the risk of further damage and bone loss that occurs after natural teeth are lost. 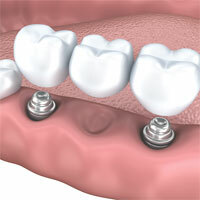 If your dentures are uncomfortable or loose, you should consider an implant supported denture. An implant denture is fitted with special fittings that ‘snap’ onto dental implants that have been strategically placed in the jaw bone for support. Generally four or more dental implants are used to hold a denture firmly in place. The secure, snug fit of an implant denture provides the patient with greater confidence when chewing and talking, as the denture does not slip - no need for messy denture adhesive! Contact Us today and schedule a consultation with our Vestavia Hills dentists Dr. Diana Wood and Dr. Melanie Spooner to learn more about how dental implants can be used to rebuild your smile.